Very nice sink. I bought this for our kitchen remodel. Much cheaper in price than most kitchen design stores but of the same quality. Highly recommend! With its angular zero radius corners, the VIGO 32 inches Ludlow Stainless Steel Undermount Kitchen Sink adds a modern, convenient touch to any updated kitchen. Fully undercoated with SoundAbsorb technology to minimize sound and reduce condensation, this spacious sink is constructed from high-quality 16-gauge, 304 series stainless steel in a premium satin finish. This set comes complete with a sink grid to protect against scratches and strainer. I went back and forth as to what sink to purchase and finally ended on this one. I love a single bowl sink. I will never go back to a double bowl sink. However, this sink is really hard to clean because it is squared at the bottom and has very minimal slope to it. You have to constantly lift the strainer out from the bottom of the sink to manually clean the sink and dig food out of the corners and manually sweep them to the disposal. I was warned about this from a friend and didn't realize I'd be doing it every single time I cook or clean the kitchen. I have a long faucet with moveable spray and it doesn't help. There is no slope to the drain. Last night I found myself intentionally cutting the tops off strawberries directly over the hole for the disposal to keep from having to lift the strainer and clean the sink. I also found the sink to scratch easily. We've had it installed for 3 months and there are a lot of scratches and we ALWAYS have the strainer/grill at the bottom. Looks great at gives a modern look to a kitchen. Looking back, I'd probably do the rounded edges to get the rounded edges/slope in the bowl and help with the cleaning. The stainless steel sink looks great in my kitchen with Jenn-Air appliances. Love this sink - it is large and spacious and great for cleaning large pots and pans after family dinners. The stainless steel is beautiful and looks sleek in our new kitchen. It adds a very modern touch, but is very utilitarian as well. The grid that comes with the sink is also awesome and is useful so that you do not scratch the bottom of the sink. If you order this sink, a pull-out sprayer faucet is needed as the sink is so big, one needs the sprayer to be able to get to the corners of the sink. My only suggestion for improvement...I wish the sink sloped down at a greater angle towards the drain. Food tends to get stuck in corners and unless you have a sprayer, it is hard to remove. Otherwise, the sink is a awesome addition to our kitchen. Wonderful sink for someone who loves to cook! I absolutely love this sink! We recently re-modeled our house and went modern/industrial with the kitchen. I nearly went the cheap rout and went with the free sink provided by my granite company but will be eternally grateful I did not. It came wrapped well without any damage and it is super deep! I can easily put my largest stock pot in the bottom and still wash cookie sheets over the top of it without splashing water. My mother-in-law jokes I could easily bathe twins in it (she is hoping for grandkids soon :). My only complaint is that it doesn't rinse super easy - you have to pull out the grate and use a sponge to clean food out of the bottom. But for the price and to someone who is used to cheap double-bowled sinks in apartments for years it is the lap of luxury! This is exactly what I was looking for. I needed a new undermount sink and faucet to go with my new quartz countertop. I really wanted to get commercial quality and a commercial look for my kitchen makeover and this sink is perfect. Not only is it beautiful and excellent quality, but the price for all three pieces was excellent as well. I was nervous about ordering it sight unseen, but because the other reviews were very good, I took a chance. I could not be happier. I also found the perfect faucet here and will be looking for light fixtures next! 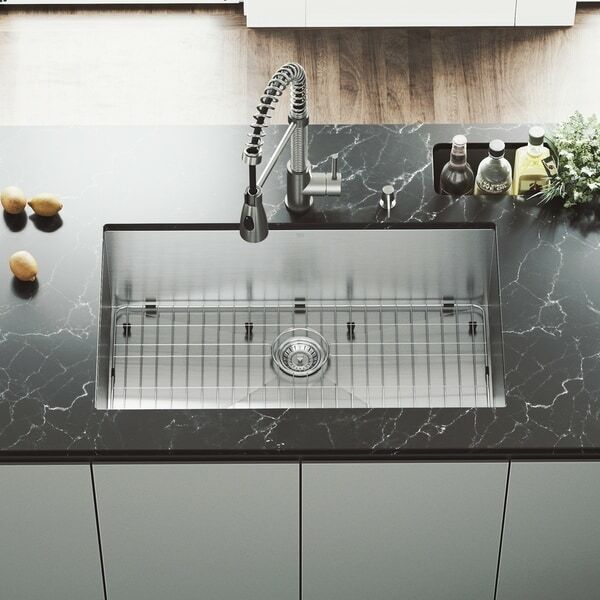 Excellent sink---great quality and looks beautiful. Bought all my sinks and faucets from Overstock and they are beautiful and functional. VIGO makes excellent products. This set came with all the accessories and well-priced. Had it in box for long time; kitchen reno done few months back and the sink is perfect! I also bought a smaller sink and VIGO faucet to complete the kitchen beverage area across from this large sink. We purchased this item only after I'd done an extensive internet search for the right dimensions, gauge of stainless steel, appearance and price. We were surprised wnen the item arrived it looked even better "in the flesh" than it had on-line. It also functions beautifully-enough depth to be very commodious. Definitely an excellent purchase. Even my father who is a plumber was impressed with the quality of the sink. Thank you Vigo for a great product. When I remodeled I wanted a larger sink, but did not want to sacrifice counter space. The extra deep dimensions on this sink, and lack of center brace separating it into two basins, gave me exactly what I wanted. Now I can wash large pots and pans without any space constraints. This is especially helpful around the holidays and large get togethers. The offset drain in the center back and included rack mean the drain always stays clear when washing dishes and never clogs with food or plates/cups blocking the drain. The heavier gauge steel and soundproofing on the outside of this sink also make it very quiet. It feels solid and does not sound tinny or cheap when pots and pans hit against he side. Overall a solid SS sink that looks great. The coating underneath gives it a solid feel and reduces noise of water hitting the bottom. Expensive looking sink! Functions great, too. We did a gut-job down to the studs on our kitchen remodel. I knew I wanted an undermount sink, preferably stainless, but they were so expensive and our budget was climbing upward (as all renovation budgets tend to do!). This sink caught my eye because of the depth and gauge and cost compared to the "big box" stores. We've had it installed for a couple of months and we love it. It's huge and can hold all my pans/crockware down in the bottom so I don't have to precariously balance them while I clean them. The grate in the bottom is an added bonus. You can stack plates on their end in the sink, similar to the dishwasher, and of course it protects the sink. It looks fantastic with our gray Quartz countertops. Would HIGHLY recommend you get this before it's sold out. I purchased the VIGO sink almost 5 years ago. Let me tell you that this sink is AWESOME!!! The seller was fast, the product came well packed and the sink was gorgeous!!! It has a few little scratches on it now but that's 5 years of dishes, pans, forks and knives being put in it every single day! My kids and husband are no very dainty when it comes to putting their dishes in sink. Thanks goodness for the Grid....it's awesome too and easy to clean!!! New undermount, single, kitchen sink for my home. I have not been able to install it yet, but the sink appears as shown on the web site. It appears to be of high quality from in-the-box inspection. I also ordered leather gloves and a knit hat with a visor for my grandson in college. He was thrilled to receive the gloves and my daughter said they were of very high quality.. There was a delivery problem with the hat, but after your customer service attempted to track their shipment, pleasantly sent him another hat at no cost to me..Kudos to your customer service department for their courteous and prompt service. Thanks again. I love this sink. I ordered it some time ago and have been waiting for our remodel to hit the right point for installation. I've been using it a week now and have no complaints. It is quiet when you turn on the garbage disposal and washing dishes in it is a breeze. This sink is huge! I love it! The quality is great!!! Very nice I am saying for a wonderful price! Purchased this sink for a flip house and it turned out to be one of my favorite parts of the kitchen. Will definitely be purchased this in the future if this still available For future renovations. Overall, I am happy with the sink. I purchased another sink that had slightly rounded corners. I find the latter much easier to clean and would, in the future, purchase the slightly rounded corners. I also removed the grid because it is too large to clean in the dishwasher and awkward to clean in the sink. Love it...does scratch up but that is why the protector is there so you don't scratch the bottom up. Great description to review prior to purchasing item. Lovely addition to our new kitchen! We love to compare and this was an easy read to know how great the item was. This was the kind of sink we were looking for. I wish I had thought about how difficult it would be to get the corners clean. They collect debris easily. I didn’t end up using the grid, it was annoying and difficult to get clean as well. This is a great sink. If you are concerned about moving to a single bowl from a double, don't be. I will never go back. I love the strainer. Great for bathing smaller dogs too. WE LOVE OUR BIG SINK! I wish I had this when my kids were little! I love the versatility of no divider for my big pots, pans and bowls. This came very well packaged and is SO HEAVY DUTY! Our cabinet guy had recommended a very similar sink that was triple the cost. I'm thrilled we found this one here on Overstock! "What size sink base is needed for this sink? I have a 36" sink base and am replacing the current sink and getting new countertops." Hello Noddleuseful, the required interior cabinet space is 34". Have a great day! This is the second one of these I have bought. Liked the quality so much! Love the size! The grid is really nice, saves the sink bottom. excellent reviews just what I was looking for and great price. "Can you install a garbage disposal?" Thank you for contacting us cathy1229. Yes you may install a garbage disposal under the sink as long as you have enough space to accommodate it. Please let us know if you have any further questions. "Can a garbage disposal be installed with this sink?" "Is this a brushed finish or high shine?" "Is this sink made in the USA?" This sink is made in China. "Is this an undermount sink ?" Yes this is an undermount sink.